Today, Mercury reaches its greatest elongation for the entire year: 27 degrees east of the sun. (Your fist at an arm length approximates 10 degrees.) Even so, the northern hemisphere has a backseat view of Mercury whereas the southern hemisphere enjoys a ringside seat. At mid-northern latitudes – like those in the mainland United States – Mercury sets an hour or so after sunset. In fact, you will probably need binoculars to catch Mercury. Farther north – like in Alaska – Mercury sets at about the same time as the sun. At mid-southern latitudes – like those in Australia – Mercury stays out for more than 2 hours after sundown. As far south as Antarctica, Mercury sets more than 4 hours after the sun. Why the big difference between the two hemispheres? 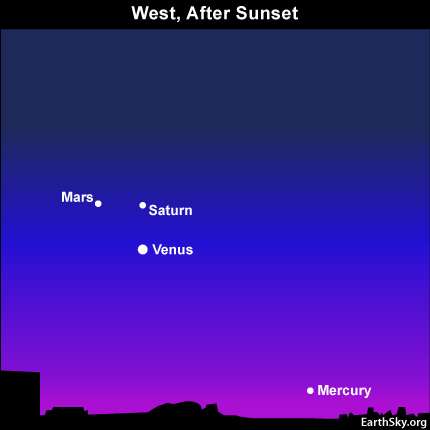 It is because Mercury sits to the side of the setting sun in our northern skies yet above the setting sun in the southern hemisphere. Site contents copyright © 2019 Recorder Online	except as noted. All rights reserved. | 83 queries in 1.288 seconds.